This week has proved to be one of those changeable weeks that included a 40 degree variation in temperature and a lot of overcast and rainy skies. Yesterday afternoon I even had a fire for a few hours. It wasn’t horribly cold but it was horribly damp, and the fire soon took care of that. I have spent some time outside, though not as much as I typically do. 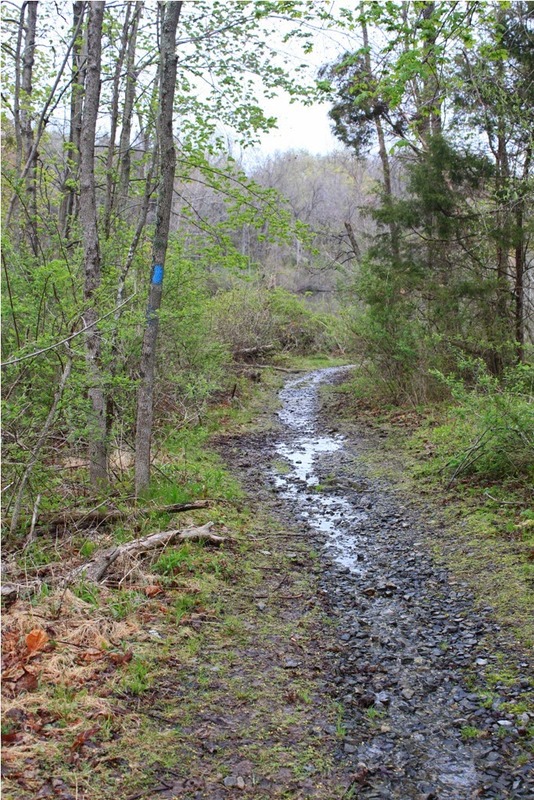 I find it hard to foray through the woods when rain pelts my face and drips under my rain jacket. I come home damp and the dogs come home wet. I easily convince myself it’s better to stay inside. The rain, however, makes for lovely sleeping weather. Most nights it’s been warm enough to leave open a few windows and cool enough to snuggle under a blanket, all the while listening to the soft sound of rain on the forest leaves outside. To me, that is about perfect. The only thing that could make it more perfect is if I’d been in my sleeping bag in a tent, possibly with dogs (as long as they were good). Few sounds are as lovely as the sound of a soft rain on the forest leaves, lulling me to sleep. I’ve had plenty of that this week. It’s not as lovely during the day when I’d prefer a foray in the woods, but I can’t have everything. This week the rain was my lullaby. 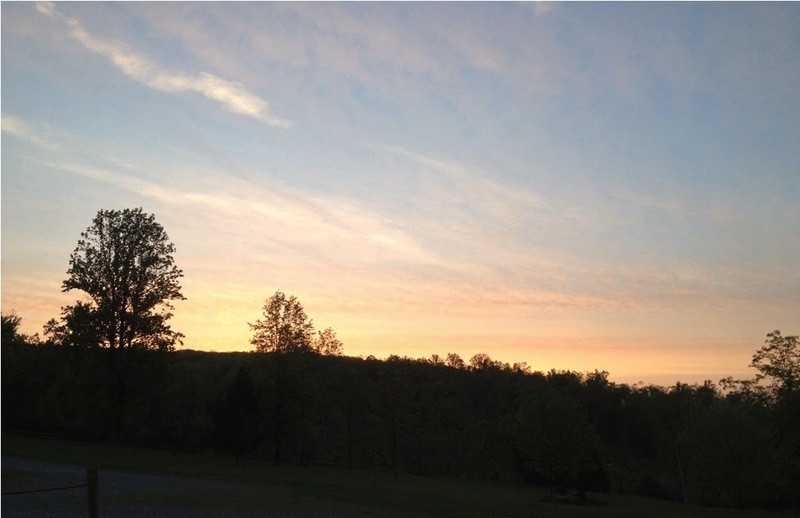 Abundant sunshine, a gentle breeze with temperatures not too hot and not too cold. That was my weekend on Roundtop Mtn. I was outside as much as I could be, nosing around, looking here and looking there, just seeing what I could see. 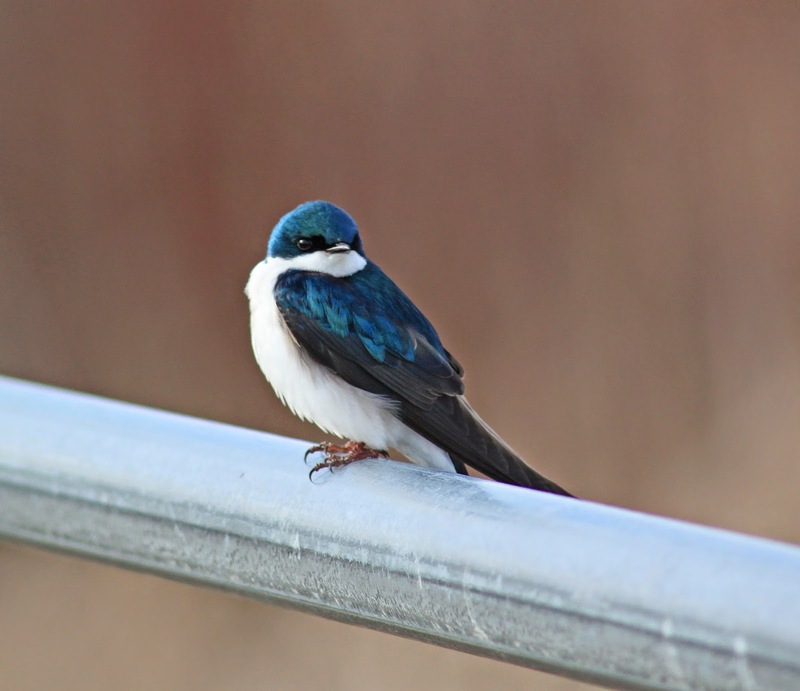 I was rewarded with more than a few good sightings. For the first time in years, I actually got to see a yellow-billed cuckoo! Cuckoos are never common, but each year I hear one or two residents, calling from all around the mountain. Often I think it’s one cuckoo, traveling from one tree to the next around the cabin. Cuckoos are notorious for being hard to see, partly because they don’t bounce around like some other birds and partly because they seem to make an effort to stay under cover. That’s a bad combination for someone hoping to see one, instead of just hearing it. On Sunday on one of my many forays out the door, I suddenly heard the call of a very close cuckoo. I didn’t have binoculars and wasn’t about to rush inside to find mine. Instead I stood in front of the cabin, trying to locate the source of the call. I could tell the call was coming from one of the tall white oaks behind the cabin but that covers a lot of trees. After a few more calls I was sure of the cuckoo’s general area but without binoculars (and perhaps even with them), locating a cuckoo in that mass of greenery was impossible. But then the cuckoo flew and for a brief second or two, I saw it as it headed further up the mountain to find another vantage point for its next round of calls. It’s always a banner day when I can see a cuckoo! Red sky again this morning and storms are heading my way. It's a summer kind of thunderstorm, though the temperature is more modest than the thunderstorm weather of midsummer. That's not much consolation as the storm itself is just as severe as those of a month or so from now. Did anyone get up/stay up for the meteor shower this past weekend? I set my alarm and got up, loading a lawn chair and Baby Dog into the car for the brief run up to the north parking lot. In my corner of the sky, the meteor shower was a bust--I didn't see a single one in the hour I was out. I did hear other areas of the country fared better and got a nice show. Ah, well, it will be time for the Perseid shower before I know it. 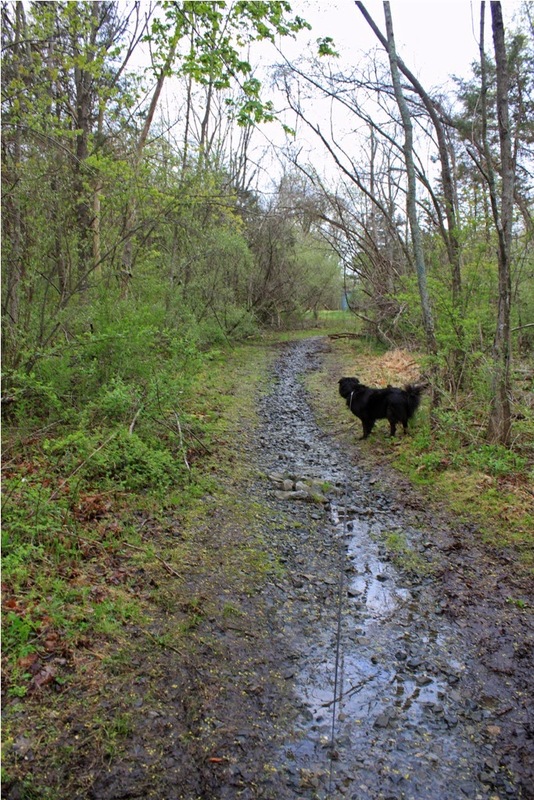 Baby Dog and I took a walk this morning along portions of Roundtop Mtn. that I don’t usually have time to visit on a weekday. But this morning no rain or thunderstorms deterred us. The puppies are off for a day being neutered and spade, and we had the morning to ourselves. The change to our routine was a good one. 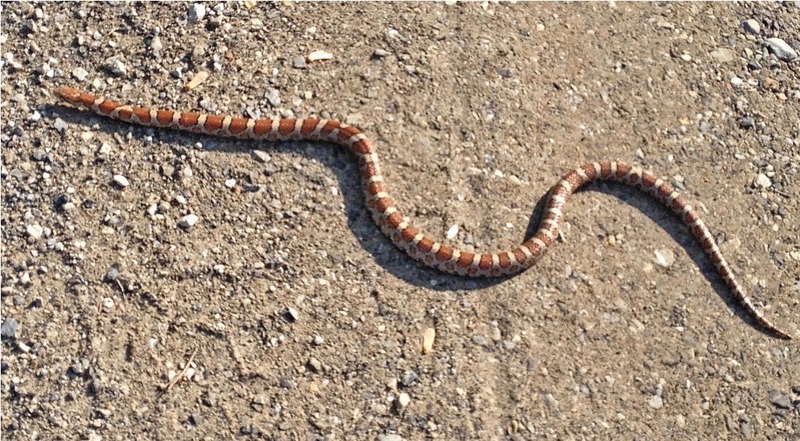 Baby Dog was the first to see the snake, a milk snake I believe, perhaps just a bit shy of 2-feet long. I’m not sure Baby Dog had ever seen a snake before. Certainly she’d never seen one slithering quickly across the dirt road in front of her before. She was forced to bark at it, of course, but was wary enough to keep a reasonable distance away. I managed one quick photo before it disappeared into the grass. 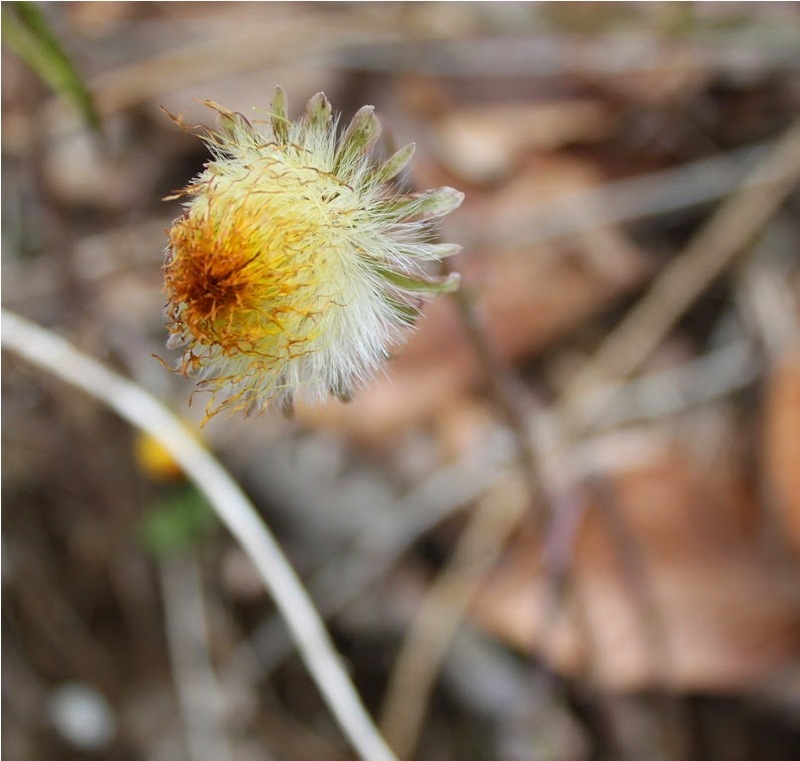 Later, I came across a nice little grouping of fleabane, likely Philadelphia fleabane. 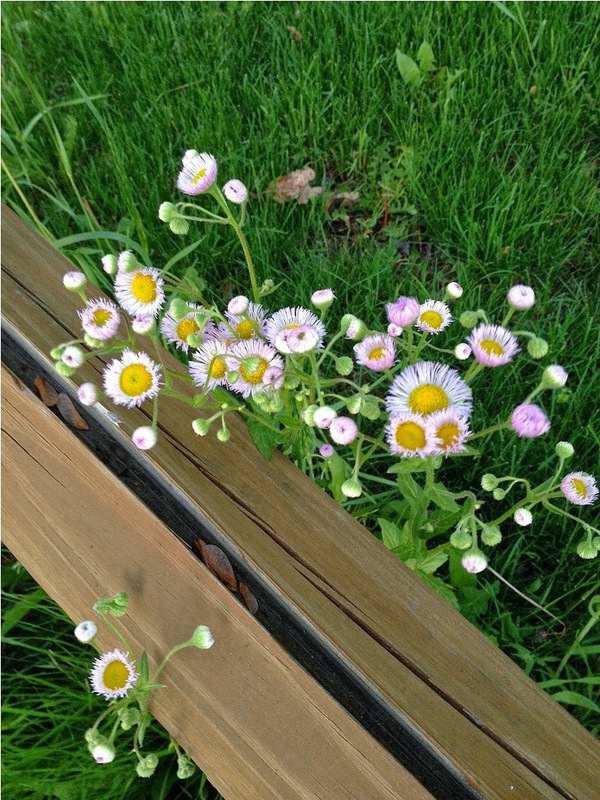 The only difference I can see between this flower and daisy fleabane is that Philadelphia fleabane tends more to the lavender shade than daisy fleabane, which is usually white or just barely tinged with lavender. The sweet song of Baltimore orioles accompanied us throughout our early morning walk. A least 6 different males, sang from every corner of the mountain. Who needs an iPod when the orioles’ song follows me everywhere I go? Tonight the puppies will be back home, and our quiet time together will be over. Baby Dog misses the puppies, and I had to tell her that will be back soon enough. I think she believed me. Sailor’s warning? So does orange count as the sailor’s warning? I suspect it might, if not perhaps quite as soon as a truly red sky. I would call this a sky of building trouble or trouble nearby if not right atop me. 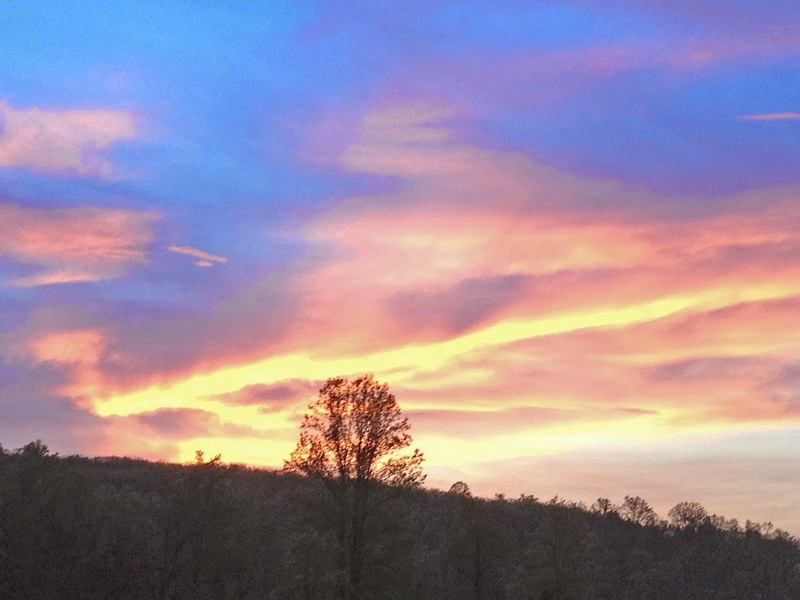 The old sailor’s warning holds true, though it also leaves a lot unknown. A sky that looks like this might be a storm that’s still hours away, perhaps no to arrive until overnight, or perhaps not even until tomorrow. This same sky could also mean that someplace nearby, say within 20-25 miles, is in for trouble and “my” sky is telling me I’m on the edge of that. 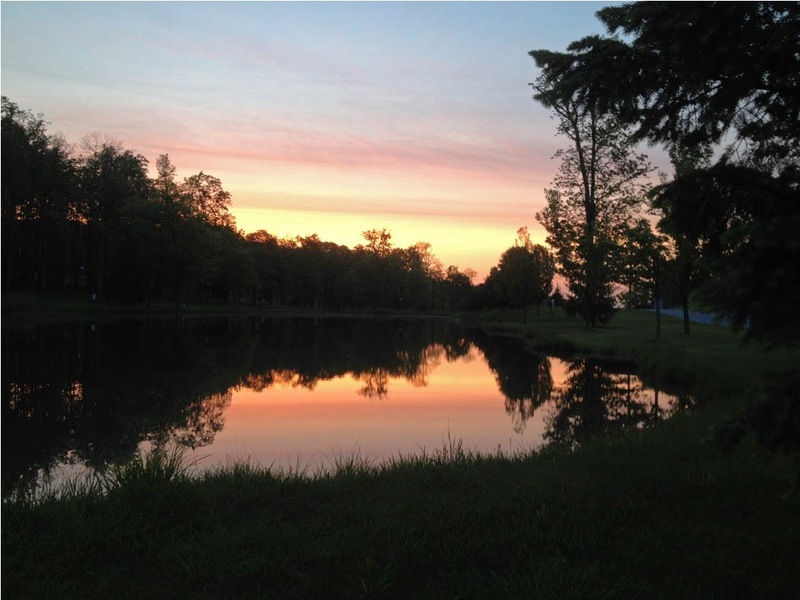 What I do know for sure is that I won’t know the answers for some hours after I see a sunrise like this. It’s the kind of sky that tells me to keep an eye to the sky to see which way of my two possibilities this sky will turn out to mean: storm overhead but hours away or storm nearby but not overhead. Either way it makes for a beautiful sunrise, but one to watch out for in the hours ahead. With spring already two-thirds gone, I should not be surprised at how many blooms are already fading. 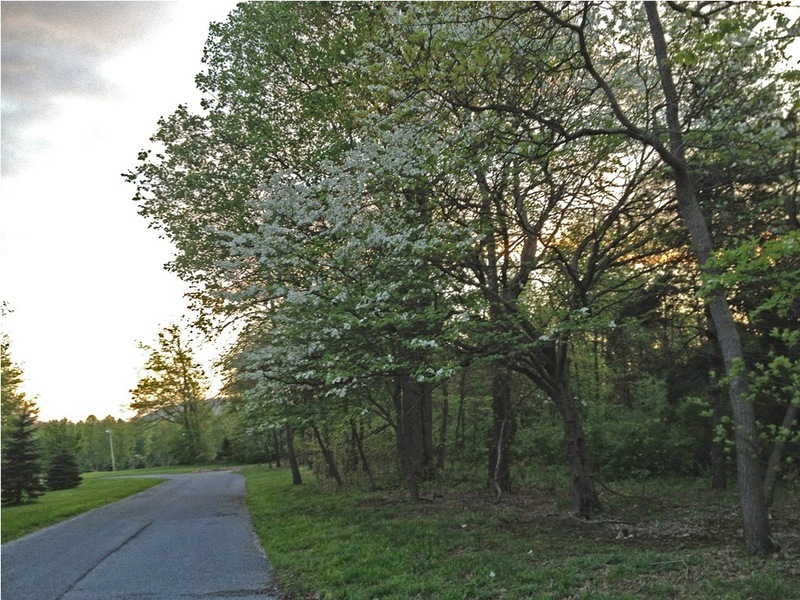 Dogwood, though near its peak when I took this photo at the beginning of the weekend, is already today past its prime. The redbud has gone to green, leaving nothing but twisted trees that look, even to my eye, as though they should be cut down before they infect the rest of the forest with some terrible disease. And with the loss of some comes the first blooms of others. The first of the wild geraniums, a delicate shade of lavender far prettier than that of their tamer, more garish cousins, are budding and almost blooming. Perhaps this evening the blooms will be fully opened. The first geese have produced three tiny goslings. Another goose, one I have dubbed Mrs. Hiss, is still on her eggs. She has chosen, rather poorly, to build her nest not 6 feet off the road around the pond near my cabin. Every time a car goes by she stands up off her nest and hisses ferociously. As nest choice goes, it’s a pretty terrible one. My view of the western mountains is gone for another 5-6 months, a sure sign that the warm seasons are in full bloom. The leaves are not yet so full that I have lost my view of the sky, though that is not long away either. The tall oaks and hickories leaf out later than the beech and the smaller trees that strive not to be pushed out of the sun by their taller neighbors. So considering that annual growth is still growing ever more lush by the day, it seems a little surprising that a few things are already dying back, done for another year. The earliest of the bloomers are already tossing seeds into the wind. 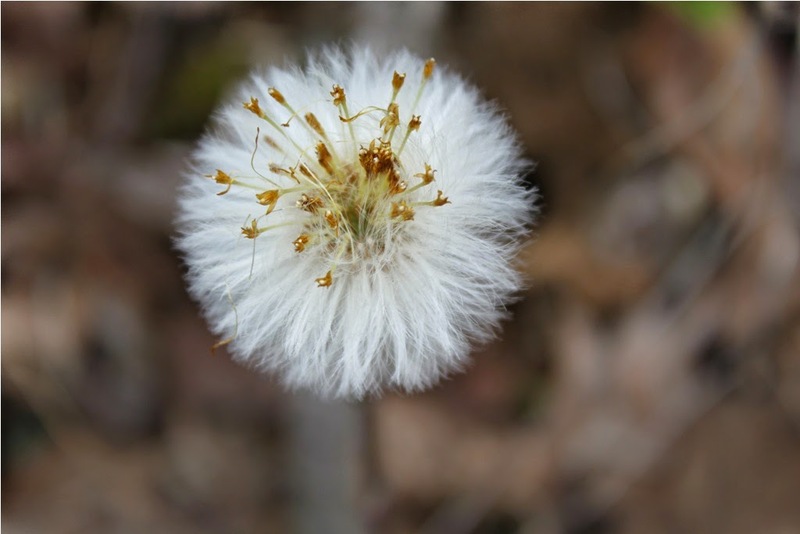 Coltsfoot, that dandelion look-alike, has turned white and fuzzy, tall stems topped by the flat, white leftovers of the yellow flower. They remind me of straw hats, the kind called “boaters.” A few still retain vestiges of the yellow flower, though tomorrow they will be little boaters, too. The warblers are about done here until fall. I had a nice few mornings dominated by chestnut-sided warblers. I don’t usually get many warblers on the side of the mountain, away from water, but I nearly always have a nice number of chestnut-sided. Or perhaps it’s only that they are easier to spot—they come down to the mid-level of trees instead of flitting through the tallest ones. On a recent misty morning warblers that favor the top canopy were nearly impossible for me to identify. They were little gray silhouettes instead of flashes of color, and my poor hearing meant I can’t hear some of them . That’s a bad combination when trying to identify them. But chestnut-sided warblers are more cooperative. I can hear their little trill and they are low enough to see well and identify. They seem more curious than most of the others, too, frequently bouncing lower to get a look at me or the dogs. 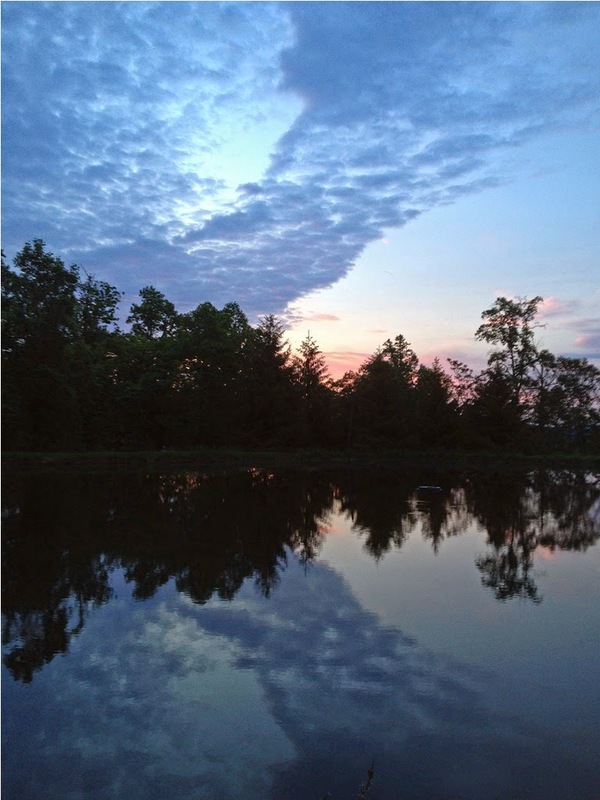 This morning the sunrise was especially good, perhaps foreshadowing thunderstorms later today. Those are another sign of the warmer weather. So far the storms have been meek—a few rumbles of distant thunder, a gathering of clouds that never quite turned into a storm. That will soon change, I’m sure. 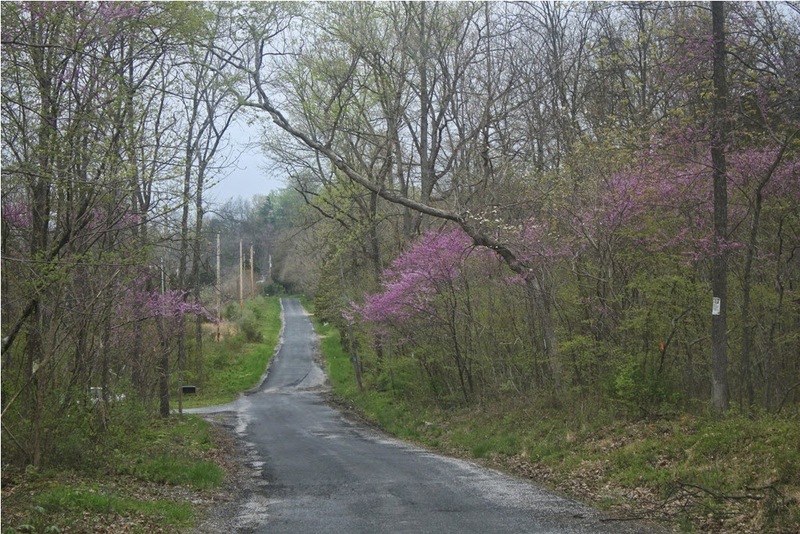 Redbud trees are in full color on Roundtop. 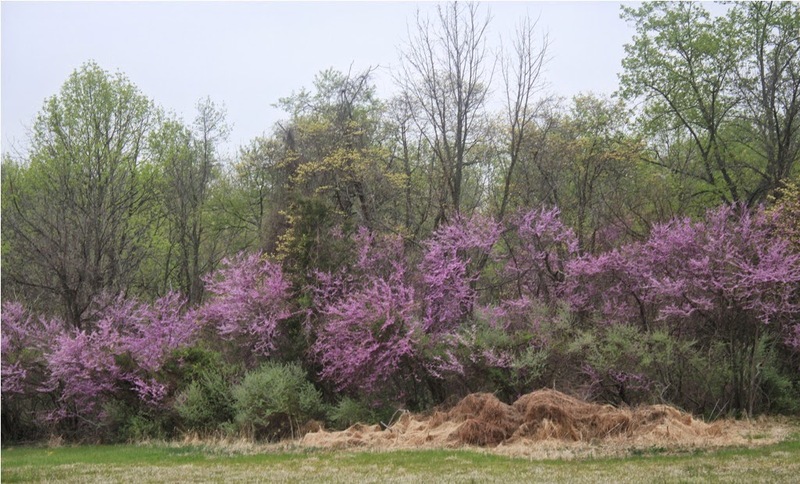 Redbuds are not flowering trees, though they appear as such at first look. The red literally is a leaf bud that will soon turn green. When that happens the trees lose all their splendor and look like something that is diseased and broken and should be cut down. Which, I suspect, is what happens to some of them when overeager brush clearers are at work once the buds turn to leaves. Redbud favor sunny field and forest edges, so I don’t have any right around my cabin. I am too deep into the forest for them, though the bottom on my lane, where the forest ends, has several of them. Splindly and misshapen as the trees are, they look like a natural, more full-sized version of a bonsai tree. The trunks and branches take on their own S-shapes, without help from a master gardener. 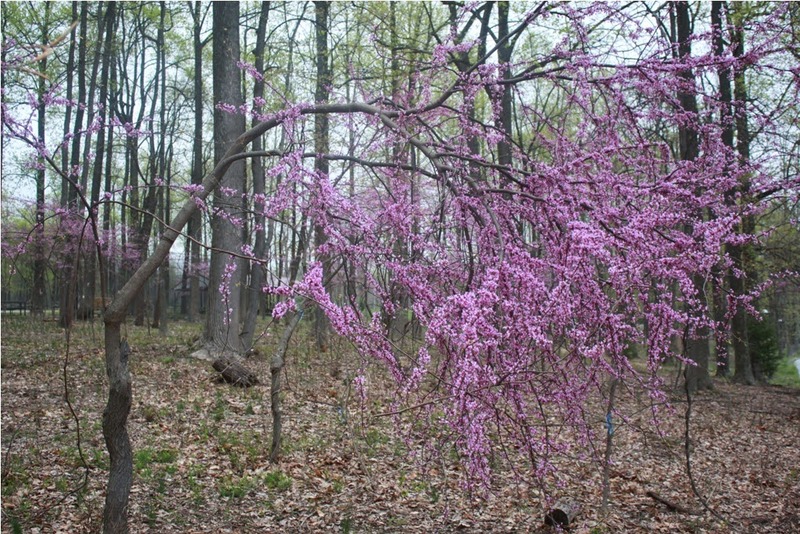 Today, the redbud are at their most brilliant for the year, but the morning is gray and a touch foggy. Professional photographers would gnash their teeth, hoping for good lighting to match the redbud’s peak. I am more interested in documenting the natural year in whatever lighting presents itself. Better lighting would be nice, but the redbud peak won’t wait for that. Too many professional photographs look garish to me and seem to reflect the photographer more than the world as I see it. I’m not convinced we do people with limited experience of the natural world any favors by showing nature in ways that don’t look natural. Nature is not Disneyland. Nature should be experienced as it is, for how else can we reach any level of understanding of it? Last week’s rain brought out the neon green of spring in a big way. Where winter browns still languished, the rain was like fertilizer, and all shades of greens soon exploded everywhere. 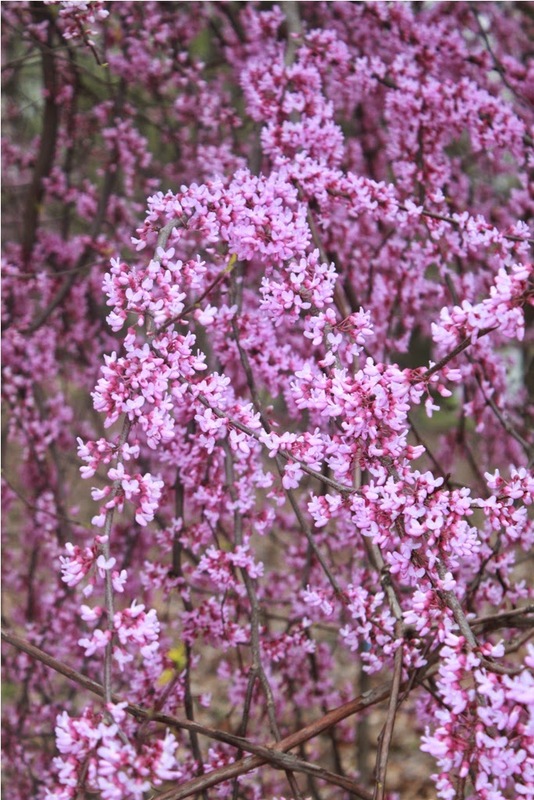 Redbud is budding, and serviceberry is blooming. The forest is red and white and green right now. 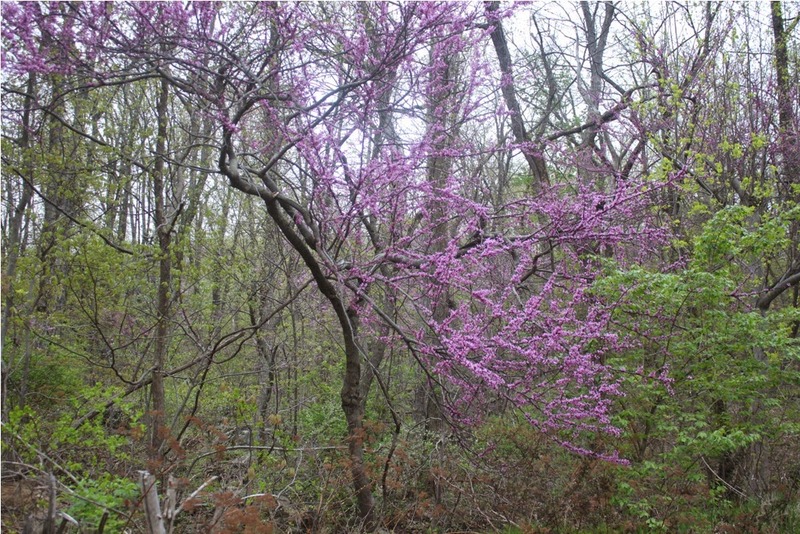 The redbud down off the mountain is in full color; the trees up on Roundtop Mtn. are not quite so far along. I am waiting a few days to take a photo of them, waiting for the color to get just a bit more intense. More wildflowers are blooming, too. 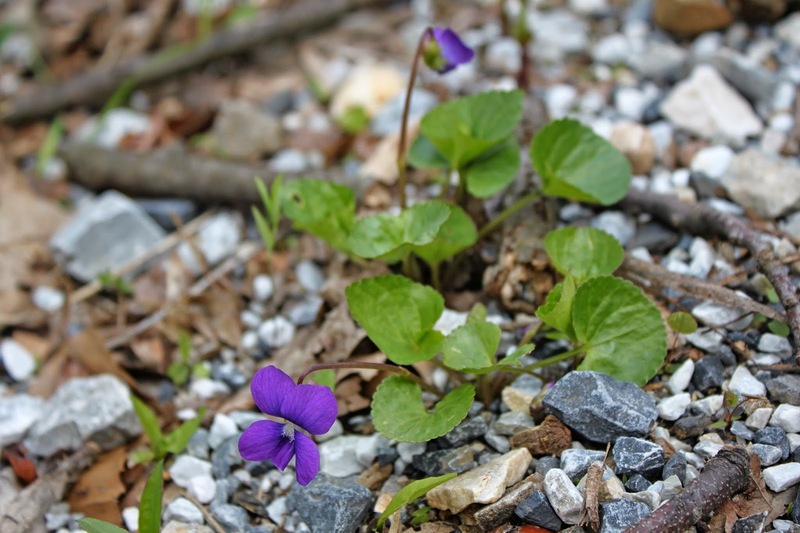 Wild violets with their luscious shades of purple are delicate as rice paper. 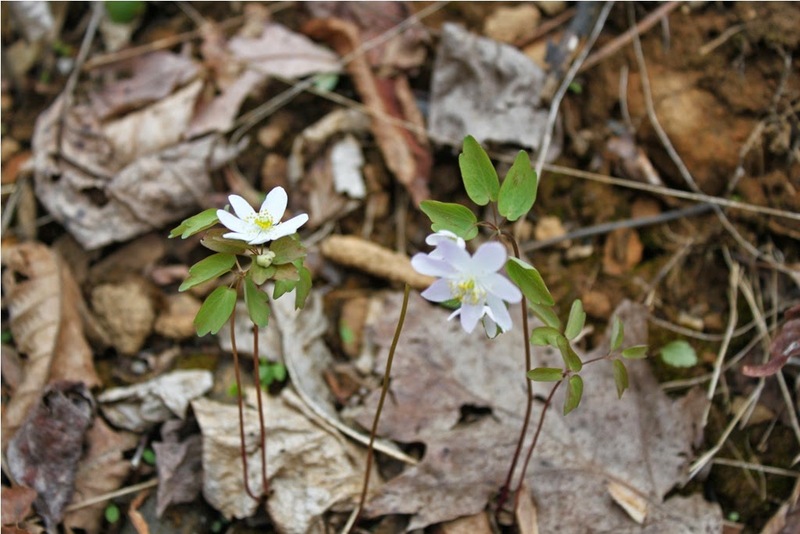 Rue anemone all but cover some sections of the forest floor. The forest is growing lush, though it is still a delicate lushness, fresh with new growth. 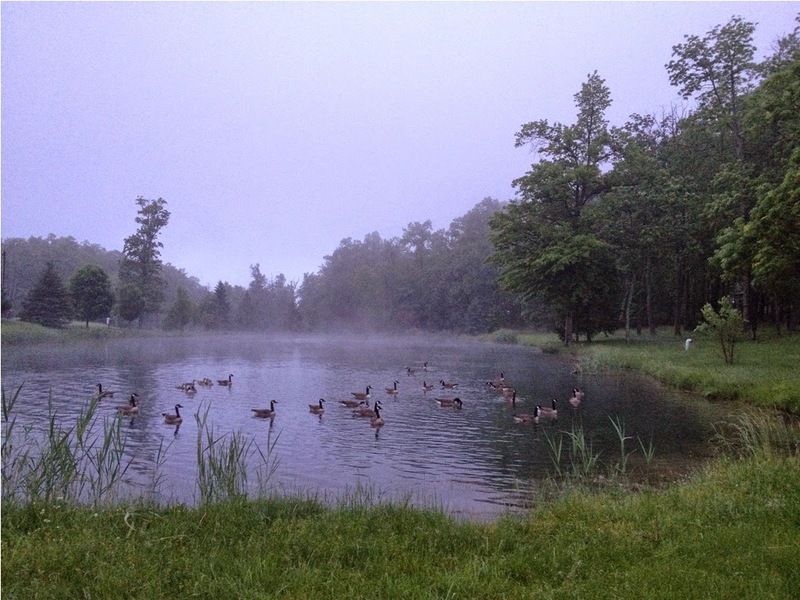 The first wood thrush and ovenbirds are now joined by several “friends” competing for territory around the cabin. Last evening I thought I heard the “whoop” of a great crested flycatcher, but it wasn’t close enough for me to be sure of that. Other migrants are starting to arrive to rest for an evening or two before heading further north. I know I heard at least half a dozen different Baltimore orioles singing last evening. I don’t expect all will stay here, though several are likely to. I often don’t see many warblers down around the cabin, unless a foggy, misty morning forces them off the mountain top. I’m sure I would find more if I climbed the mountain in the early morning, but my mornings are too hectic and short for that. Maybe next year. It’s spring again and time to be outside. After the deluge earlier in the week, I was ready for some drier weather and some time outdoors! Spring is springing, and the annual explosion of new growth happens quickly. Miss a week and suddenly it’s summer. Baby Dog and I decided (well, I decided and she readily agreed) to go for a walk. Although up at our cabin the ground has already drained from the 4 inches of rain that fell, flatter land at lower altitude was still soggy. In other words, we didn’t get too far. I could easily have returned to the cabin for my wellies, but I didn’t want to have a wet and muddy dog dirtying up the car, so we aborted our walk and returned to higher ground. Baby Dog was fine with that—she got a car ride and a cavort around the mountain. Spring is further along down off the mountain though not by too much. It won’t be very long before I lose my view of the mountain to the west for another 5 or 6 months. At the moment, I can still see the mountain through a maze of budding leaves. Even that level of visibility will be gone in 2-3 weeks. My last frost was April 18, and though the temperature has been very close to freezing several times since then, it hasn’t actually dropped to that magic number. At this point, it’s unlikely to. The first wood thrush have arrived by my cabin, and the first ovenbirds. I head the sweet songs on Monday evening, the day before a long stretch of rain inundated the mountain. The rain stopped late last evening, but I still feel I’m living in a bog. The ground squishes underfoot and puddles are everywhere. And since I’m living on the side of a mountain, you can guess how bad it is in a valley or on flat land. Those areas are flooded; houses are sometimes on little islands, like castles with a moat. But this afternoon the fog has lifted and for the first time in days the sun is out and the day is warm. The streams will recede and the island houses will revert to houses with lawns in another day or two. I hope the break in bad weather continues for a while. 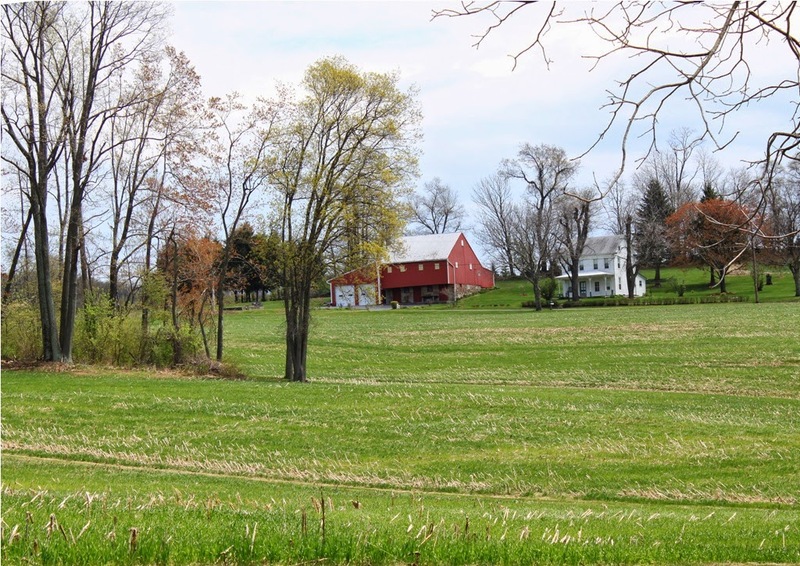 Outside chores are piling up around my cabin, and my list of them gets longer every day—move the chicken pen, clean up extraneous junk that somehow has appeared, clean the gutters, trim back the fast-growing underbrush. I need more than a few sunny weekend days to even make a dent in the list. I am also starting to think that for the first time in years I won’t have bloodroot at the cabin. The little flowers haven't appeared yet, and at this point in the season I suspect they won't at all. I watch the patch where they grow anxiously but see no sign of them. The area hasn’t been disturbed at all, so I have no obvious explanation for why they haven’t appeared. Now that I have wild violet in the woods, I’m thinking I won’t have the bloodroot at all this year. At least, I hope it’s only this year that they don’t appear. I’ve gotten used to these one-day wonders, and I hate to think it may well be another full year before I can see them again at the cabin.